Convergence HC - купить по выгодной цене | Магазин комиксов "Двадцать восьмой"
Where do worlds go when they die? The Earthquakes felt round the Multiverse, Superman's lost days after "Doomed," the World's End - all these points will converge as the history of the DCU is spun from a new perspective, the perspective of a mad god and his arrogant child. The biggest story in DC history ties into literally every DC story ever told - and it all begins here. Kingdom Come, Red Son, Wild West Justice League, Captain Carrot and the Zoo Crew - all the worlds you remember can still be found on Telos. Everything matters. Every story matters. This new mega-event, written by Jeff King, showrunner for the hit USA show White Collar and Scott Lobdell (RED HOOD AND THE OUTLAWS), will bring together heroes and villains from over seven decades of DC Comics lore in the most epic saga in company history. 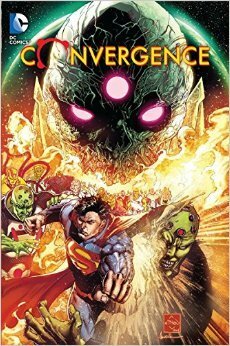 Collects CONVERGENCE #0-8.